The wedding stationery ranges have evolved and developed during the last four years in business. They are all individually made by hand using speciality and handmade papers; they have coordinating insert paper and a coordinating envelope. With inserts printed on a laser printer the overall finish is elegant yet individual. 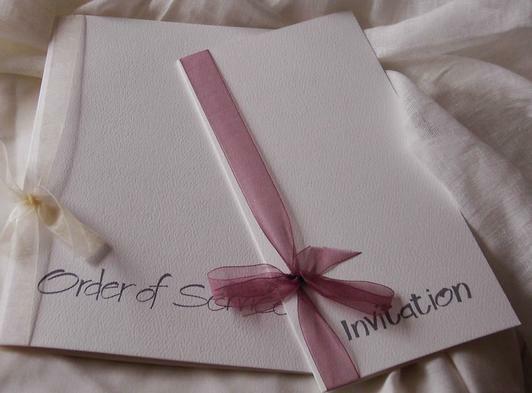 Plain, white invitation envelopes are banned! For couples arranging larger weddings, quantity discounts are available. Day and evening invitations can be grouped together to obtain the discounted rate provided the same cover design is chosen. Calligraphy - the art of beautiful writing - can enhance your wedding or party stationery, provide a handwritten gift for a friend or loved one, document years of family history research, or record the achievements of students or staff. Choosing handwritten work over a typed equivalent will provide the recipient with something to treasure. During the main wedding season I am very busy. If you would like work to be completed between April and September, you are advised to book. A small deposit will secure a time slot for your work. Click here to view examples of commissions.